A Nashville television station has highlighted a Tennessee collision repairer’s lawsuits against GEICO and Progressive — as well as brought up former insurance estimator’s 2014 insider revelations of steering by Progressive. In a similar fashion as other coverage of shops’ disputes with insurers, the WSMV report posted online Thursday focuses on insurers requiring aftermarket/used parts and “steering” to particular shops. Potts says in the broadcast that Progressive’s preferred auto body shop quoted him a $792.98 estimate to fix car damage, something that was laughed at by another shop owner and contradicted by a third’s more than $2,836.87 estimate. “There’s no question that they steered me to their appraiser, and he just so happened to be in a preferred body shop,” he told the station. He attributed the difference to aftermarket parts allowed under his policy. We couldn’t obtain Price’s lawsuit against GEICO, but his lawsuit against Progressive (actually two cases being handled together), Price’s Collision Center v. Progressive, was available. It recently was allowed to remain in Tennessee, as Price had wanted, instead of being consolidated with other states’ cases in Florida. It alleges that Progressive breached contracts by failing to pay for the necessary repairs on two customers’ vehicles and improperly meddled by steering. “It had become glaringly clear to me that this problem (steering) was getting worse,” Price told WSMV. Unlike other items filed in Price’s case against Progressive, former Progressive manage repair representative David Edwards’s September 2014 affidavit wasn’t sealed, and the station described it in the broadcast posted Thursday. We obtained a copy as well. In the document, Edwards said he had worked as an estimator, expert process property damage specialist, network manager and supervisor at Progressive for more than 17 years until Aug. 12, 2014. 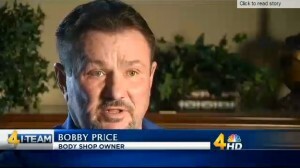 In April 2014, he was assigned specifically to Price’s customers. “In my experience, it was unusual for an MRR like myself to be assigned to one series of shops, especially given how far away Price’s shops were from one another,” Edwards states. “In my opinion, Progressive employees did intentionally steer insureds and claimants way from Price’s Collision Center,” Edwards continued. Edwards said “management told its Progressive employees that it did not want vehicles repaired at Price’s Collision Centers,” and this was “well-known” at the Nashville office. Meanwhile, Progressive was evaluating adjusters on how many claims were handled at network shops, he said in the affidavit. Edwards said he’d personally heard managers disparage Price and his shops, including one saying “I hate these motherf–s” as the supervisor and Edwards pulled into a Price’s Collision.